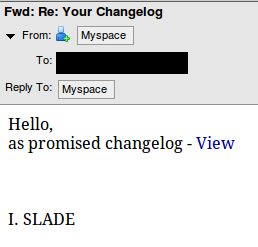 There was once a time when reading my spam folder was actually entertaining. I got to sift through wild stories about Nigerian royalty, deceased relatives I never knew I had, and relatives claiming to be stranded in faraway lands like Spain and England, mugged, and without their passports. 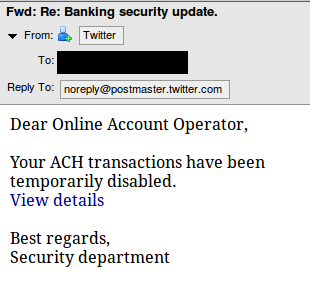 But lately, I’ve been looking for humorous spam emails like these, and I’ve been very disappointed by the lack of effort put forth by today’s spammers. 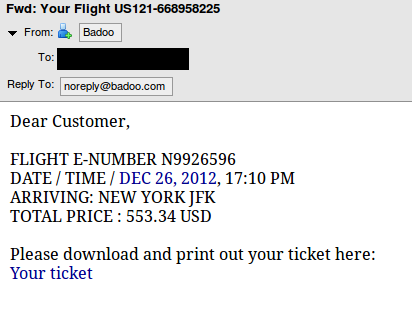 Interesting… I can’t say that I remember scheduling a flight into New York, but who am I to argue with a legitimate airline like Badoo? This might be more convincing if I actually knew VERNELL, or had an HP scanner. 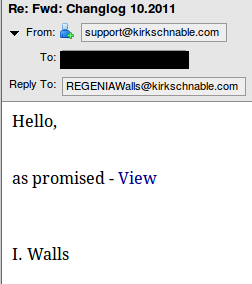 It’s kind of amusing that they originated the email from my own domain name. 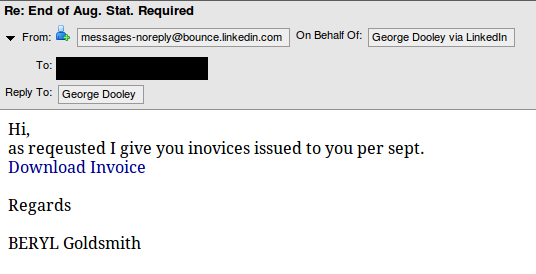 I have no idea who you are, JENELLE MOSELEY, but I will certainly do everything in my power to help you with this bill. Were you recently hired in at my company as a book keeper and I wasn’t told? In my entire Junk folder, the only email I found with any effort put forth was this fake order confirmation from Intuit. Sometimes, I yearn for the days of Nigerian royalty. As we all know, AT&T has a history of trying to gouge its unlimited data customers. AT&T discontinued unlimited wireless data plans a few years ago, and would undoubtedly enjoy having the remaining grandfathered unlimited users become tiered data customers. Despite this general attitude, AT&T has made surprising decisions, like the decision to allow the transfer of unlimited data plans to the new LTE iPads. At the time the news was reported, it was stated that the iPad unlimited users would remain unthrottled for the time being. There were no guarantees made regarding the future of their unthrottled status, but it put iPad customers in a better position than iPhone customers, who are actively being throttled after 5GB of LTE usage. Since I got my iPad 3, I’ve been enjoying my unlimited data privilege, reminding myself periodically that it is a privilege which AT&T feels like they can take away from me at some unspecified future date. I regularly use anywhere between 6GB and 12GB of data in a billing cycle, and I had yet to be subject to any throttling on LTE or HSDPA+ 4G. That is, until last night. Last night, I received a video Skype call from a friend while connected to HSDPA+ 4G. I answered with my front facing webcam, generating what was probably a rather sizable stream of data in the download and upload direction. I was on the video call for about an hour, which is longer than I’ve ever been on a video call while on my cellular data. Afterwards, on a whim, I decided to run a speed test. My result was not particularly fast… it was 1.87Mbps. I can typically get anywhere from 6-10Mbps on my HSDPA+ connection. So, on a whim, I ran another speed test… 1.87Mbps again. Hmm, that’s strange. I am still not sure what caused this phenomenon, but it definitely looks like some kind of throttling to me. 1.87Mbps is 1914.88Kbps… so I suspect it’s possible that a cap somewhere set to 2000Kbps could cause this speed test result. I decided to power cycle my cellular radio in my iPad. Upon reconnecting to the AT&T network, I found that my speeds had returned to normal. So, if this is a bandwidth throttle from AT&T, why was it activated? I decided to take a look at my data usage. It was eerily close to 5GB of usage. But then why was the throttle reset when I power cycled my cellular radio? This may be a mystery I will never have an answer to. I suppose it’s possible that a glitch on my specific cell tower could have caused the phenomenon in the first place, and power cycling created a new data session, or connected me to a different cell tower. 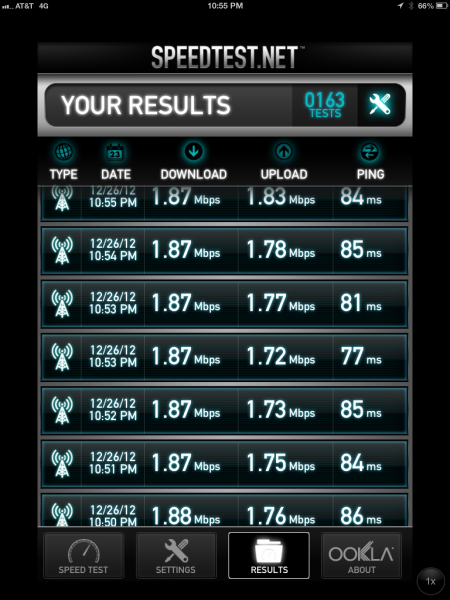 I would be interested to learn if other AT&T users have ever seen a 1.87Mbps throttle. AT&T has a page explaining their data usage policies for unlimited smartphone customers, but at the time of this writing, the page does not discuss tablet customers, and does not mention specific throttle speeds. For now, I will continue using my data normally, and continue keeping my eye out for throttling. My DVD burner can now burn 18.4 EB DVD’s. We recently switched over from Windows to Ubuntu on a lot of our computers (about 400 computers) for many reasons I won’t get into now. One thing I can say is that our ancient 8-10 year old computers run [b]so[/b] much better than they did with Windows. We would frequently run into hardware related issues where Windows would randomly blue screen. The same computers with Linux on them run just fine. Have for quite some time now. We notice that computers with failing hardware seem to run fine with Linux… see some of the amazing pictures below on functioning Linux computers. 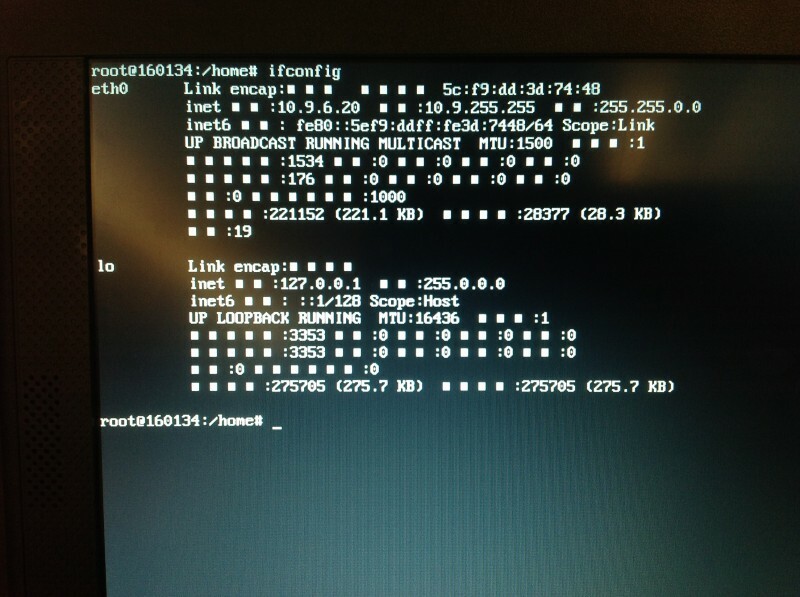 Ifconfig, at least we got our IP of the computer. 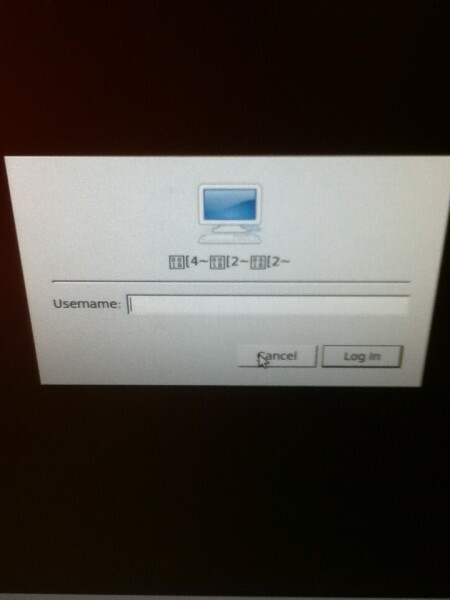 That ASCII is supposed to be the computer name. Upon investigating a lack of hard drive space on a server I brought up the disk usage analyzer and scanned the remote drive.